Guest post by BlondeLucy, the Extraordinaire! Okay, so she doesn’t really go by “BlondeLucy” but that’s what I like to call her because I love her name, and I love her blogging persona at BlondeWriteMore. “Ahh,” you’re saying, “Now we know who you’re talking about!” Yes, it’s that special lady, that fun friend, my IBFF guest posting for us today! 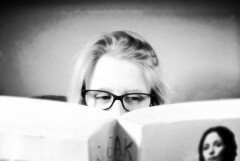 I cornered her on the blog and enticed her with pretty words to tell us what book might have helped to inspire her desire to write. If you’ve never visited, BlondeLucy’s blog at BlondeWriteMore then I suggest you head over there right now. Don’t worry, we’ll wait for you while you peruse her pleasant prose and posts. After you’re done, though, don’t miss out on this gem she’s shared with us below! BLONDE the one who can and will Write More! What book inspired me to start writing? Up until 2014 I was a casual writer. I wrote to my parents from University making them laugh with all my student exploits, I wrote mad, hormone fuelled stories whilst heavily pregnant with my children, and when I was bored I would scribble a few words down. Nothing serious. Then I read this book. My entire life changed forever. Stephen King called The Passage ‘enthralling’ by the way. This book unlocked something deep inside me. I became gripped with this powerful and gripping urge to write and to keep writing. After reading this book I went into this weird writing frenzy. It consumed me and it hasn’t stopped. I have read this book again and again over the last 12 months and every time it just fuels my burning desire to write. Now, before I go into detail on the book I must make you aware that this book was not something I would normally have read. I was not a fan of post-apocalyptic fiction nor was I fan of vampires. Up until reading this book I enjoyed a diet of mass market thrillers and easy on the eye chick lit novels. I chose this book at a motorway service station out of boredom. The motorway was gridlocked due to a crash and I was going nowhere for several hours. I don’t think I even read the blurb on the back. So where do I start on telling you about this book? 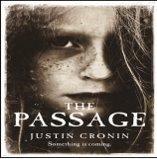 I love the way Justin Cronin writes, I am in awe of his wonderful style of writing which is rich in description, so engaging and very thought-provoking. It is such an epic and gripping tale with an amazing plot, ablaze with so many creative ideas, and some really bold characters. It’s about Amy Harper Bellafonte, described in the opening sentence as the “the One Who Walked In, the First and Last and Only, who lived a thousand years.” She is six years old, abandoned by her mother and then pursued by some Special Agents who are working for some shadowy figures behind a government experiment. The experiment involves inoculating 12 Death Row prisoners and little Amy with a mysterious new virus. Chaos breaks out when the experiment goes wrong and the outbreak of the virus on a national scale causes society to collapse. Special Agent Brad Wolgast, one of the Special Agents sent to track Amy down, helps Amy escape however the virus has changed her forever. Skip 100 years and you are introduced to Peter and the new colony of humans who have had to rebuild life. They live in fear of the ‘virals’ – those infected with the virus. He and his friends are forced to leave the colony and to seek a solution to save mankind. The characters have these powerful relationships with each other and I don’t think I have cried so much over a book than I did with this. The relationship between Amy and Agent Brad Wolgast is very moving and at one point I was bawling my head off. I found myself emotionally attached to the character of the Nun ‘Sister Lacy Antoinette Kudoto’, who has some mysterious supernatural senses and helps Amy. I had a huge romantic crush on Peter and I am still dealing with that. It changed my life. There is something about this story that blew my blonde mind. I want to write and do what Justin Cronin has done. I want to inspire people to write once they have read my stuff. I want to chuck out all the creative boundaries and do something different. I will never forget it and yes I have read the sequel! Don’t you just want to go and read that book now? I know I do! I want to sit down and write and write and write until my words move a person like Mr. Cronin’s have moved my dear friend. Don’t forget to hop on over to BlondeWriteMore and follow along. Her posts are regular, most often amusing, helpful, and always fun. I agree. It’s pretty amazing. Great post, BlondeLucy! Oooh, I want to be able and write like that too! Inspiring others! It’s daunting, the TBR list! I hope Heaven has a good library.